This chemistry dictionary offers the chemistry definitions starting with the letter E. These glossary terms are commonly used in chemistry and chemical engineering. Click the letter below to find the terms and definitions beginning with that letter. earths – Earths is an alchemical and old chemical term for compounds were thought to be elements but were later discovered to be metal oxides. ebullition – a phase transition from the liquid state to the gas state, usually occurring when a liquid is heated to its boiling point. EC – EC stands for Electron Capture. See the electron capture definition below. eclipsed conformation – Eclipsed conformation is the conformation that occurs when the dihedral angle between two atoms or groups of atoms is 0°. The atoms or groups of atoms around the single bond align with each other where they would overlap or eclipse each other if viewed along the axis of rotation. effective nuclear charge – The effective nuclear charge is the net charge an electron experiences in an atom with multiple electrons. Higher energy electrons can have other lower energy electrons between the electron and the nucleus, effectively lowering the positive charge experienced by the high energy electron. Example: A 2s lithium electron can have 2 1s electrons between itself and the lithium nucleus. Measurements indicate the effective nuclear charge experienced by a 2s lithium electron is 0.43 times the charge of the lithium nucleus. effervescence – Effervescence is the foaming formed as a result of a gas being evolved from a solid or liquid. efflorescence – Efflorescence is the process of losing the water of hydration from a hydrate compound. effusion – Effusion is the movement of a gas through a pore or capillary into another gaseous region or into a vacuum. Einstein’s equation – the relation ΔE = Δmc2, relating energy and mass changes, where E is energy, m is mass, and c is the speed of light. einsteinium – Einsteinium is the name for the actinide element with atomic number 99 and is represented by the symbol Es. elastic – A substance is elastic if substance returns to its original shape after being deformed. elasticity – Elasticity is a physical property of a material where the material returns to its original shape after being deformed. elastic limit – Elastic limit is the maximum amount of force that can be applied to a substance before it is no longer elastic. elastomer – An elastomer is a polymer that can be stretched and returns to its original shape without permanent deformation. Example: Natural rubber is an elastomer. electric circuit – A circuit is a closed path through which electric current can flow. The current can flow in the form of free electrons or as ions. electrical conductivity – Electrical conductivity is the measure of the amount of electrical current a material can carry. Electrical conductivity is denoted by the symbol σ and has SI units of siemens per meter (S/m). electrical resistivity – Electrical resistivity is the measure of how much a material resists carrying an electrical current. Electrical resistivity is denoted by the symbol ρ and has SI units of ohm meter (Ωm). electric dipole – An electric dipole is formed when the centers of positive charges and negative charges do not coincide. Example: Polar molecules are electric dipoles. electric field – An electric field is a field around charged particles and changing magnetic fields which exert a force on charges within the field. Electric field is defined as the electrical force expressed on a stationary positive charge. electrochemical cell – An electrochemical cell is a device that generates a potential difference between electrodes using chemical reactions. Examples: Galvanic cells and electrolytic cells are examples of electrochemical cells. electrochemistry – Electrochemistry is the scientific study of the chemical species and reactions that take place at the interface between an electron conductor and an ion conductor (electrolyte) in which an electron transfer occurs between the electrode and the electrolyte in solution. electromotive force – emf – Electromotive force is the electric potential generated by either an electrochemical cell or a changing magnetic field. Electromotive force is commonly denoted by the acronym emf, EMF or a cursive letter E ( ℰ ). The SI unit for electromotive force is the volt. electrode – An electrode is a general term applied to the either the anode or cathode of an electrochemical cell. electrode potential – Electrode potential is the potential difference between the electrode and its solution. electrokinetic potential – The electrokinetic potential is defined as the potential difference across phase boundaries between solids and liquids. In colloids, the electrokinetic potential is the electric potential difference across the ionic layer around a charged colloid ion. Typically, the higher the electrokinetic potential, the more stable the colloid. When the zeta-potential equals zero, the colloid will precipitate into a solid. electrolysis – Electrolysis is the passage of a direct electric current through an ion-containing solution. Electrolysis produces chemical changes at the electrodes. electrolyte – A substance which forms ions in an aqueous solution. Examples: NaCl forms Na+ and Cl– in water. electrolytic cell – Electrolytic cell is a type of chemical cell in which the flow of electric energy from an external source causes a redox reaction to occur. electromagnetic radiation – Electromagnetic radiation is self-sustaining energy with electric and magnetic field components. Electromagnetic radiation is commonly referred to as ‘light’. electron – An electron is a negatively charged component of an atom. Electrons exist outside of and surrounding the atom nucleus. Each electron carries one unit of negative charge and has a very small mass as compared with that of a neutron or proton. electron affinity – Electron affinity reflects the ability of an atom to accept an electron. It is the energy change that occurs when an electron is added to a gaseous atom. Atoms with stronger effective nuclear charge have greater electron affinity. H(g) + e– → H–(g); ΔH = -73 kJ/mol. Example: Nitrogen-13 decays to Carbon-13 by electron capture. electron cloud – The electron cloud is the region of negative charge surrounding an atomic nucleus that is associated with an atomic orbital. electron configuration – Electron configuration is a statement describing the populations of electronic energy sublevels of an atom. See the chart of electronic configurations to get the notation for all of the elements. Example: The electronic configuration of the lithium atom is 1s22s, which indicates there are two electrons in the 1s sublevel and one electron in the 2s energy sublevel. electron density – Electron density is a representation of the probability of finding an electron in a specific location around an atom or molecule. In general, the electron is more likely to be found in regions with high electron density. electron domain – Electron domain refers to the number of lone pairs or bond locations around a particular atom in a molecule. Bond location is independent of whether the bond is a single, double or triple bond. Electron domain is used in VSEPR theory to determine the molecular geometry of a molecule. electronegativity – Electronegativity is a property of an atom which increases with its tendency to attract the electrons of a bond. Example: The chlorine atom has a higher electronegativity than the hydrogen atom, so the bonding electrons will be closer to the Cl than to the H in the HCl molecule. electron pair – An electron pair is a pair of electrons in one orbital which have opposite spins or a pair of electrons in a covalent or coordinate bond. electron pair repulsion – Electron pair repulsion is the principle that electron pairs around a central atom tend to orient themselves as far apart as possible. Electron pair repulsion is used to predict the geometry of a molecule or a polyatomic ion. electron-sea model – The electron sea model is a model of metallic bonding in which cations are considered to be fixed points within a mobile ‘sea’ of electrons. electron shell – An electron shell is a set of atomic electrons grouped together by their quantum energy levels. electron spin – Electron spin is a property of an electron that is loosely related to its spin about an axis. Two electron spin states are allowed, which are described by the quantum number ms, with values of +½ or -½.
electrophile – An electrophile is an atom or molecule that accepts an electron pair to make a covalent bond. Examples: H+ is an electrophile. It can accept a pair of electrons from the Lewis base OH– to form H2O. electroplating – Electroplating is a process where a coating of metal is added to a conductor using electricity via a reduction reaction. When a current is applied to the conductor to be coated, metal ions in solution are reduced onto the electrode to form a thin layer. electrostatic forces – Electrostatic forces are the forces between particles that are caused by their individual electric charges. electrum – Electrum is a naturally-occurring alloy of gold and silver with a few other metals. The man-made alloy of gold and silver is chemically similar to electrum, but usually, is called green gold. element – A chemical element is a substance that cannot be broken down by chemical means. Elements are defined by the number of protons they possess. elementary reaction – An elementary reaction is a chemical reaction where reactants form products in a single step. element symbol – Element symbol refers to the one- or two-letter abbreviation for a chemical element, though the term can be applied to the alchemical symbols as well. ELF – ELF is an acronym for Extremely Low Frequency. In general, ELF refers to the part of the electromagnetic spectrum with frequencies from 1 to 300 Hz. In radio and atmospheric studies, ELF refers to radio waves with frequencies between 30 and 3000 Hz. elimination reaction – An elimination reaction is a type of chemical reaction where a reactant loses atoms or groups of atoms and forms a double bond. embrittlement – Embrittlement is the loss of ductility through a chemical or physical change. Example: Freezing fruit with liquid nitrogen is an example of embrittlement. emissions – Emissions are the products produced other than heat in a combustion reaction. Example: Carbon dioxide is a common emission from combustion reactions. emission spectrum – Emission spectrum refers to the range of wavelengths emitted by an atom stimulated by either heat or electric current. The emission spectra is unique to each element. emissivity – Emissivity is the ratio of energy emitted by a material to the energy emitted by a black body at the same temperature. Emissivity values range from 0 to 1. The ‘shinier’ an object is, the lower the emissivity. Dark objects have emissivity values closer to 1.
empirical formula – The empirical formula of a compound is a formula that shows the ratio of elements present in the compound. The ratios are denoted by subscripts next to the element symbols. Example: Glucose has a molecular formula of C6H12O6. It contains 2 moles of hydrogen for every mole of carbon and oxygen. The empirical formula for glucose is CH2O. emulsifier – An emulsifier is a compound or substance at acts as a stabilizer for emulsions preventing the liquids from separating. Example: Egg yolks are used as an emulsifier in mayonnaise to keep the oil from separating out. emulsion – An emulsion is a colloid of two or more immiscible liquids where one liquid contains a dispersion of the other liquids. Example: Oil and water mixtures are emulsions when shaken together. The oil will form drops and disperse throughout the water. enantiomer – An enantiomer is one of a pair of optical isomers. Example: The central carbon in serine is the chiral carbon. The amino group and hydrogen can rotate about the carbon, resulting in two enantiomers of serine: L-serine and D-serine. endergonic – Endergonic refers to a chemical reaction where the free energy of the system increases. Endergonic reactions absorb energy from their surroundings and are not spontaneous. endothermic – Endothermic describes a process which absorbs thermal (heat) energy. enediol – An enediol is an alkene enol with a hydroxyl group attached to both carbon atoms of the carbon double bond. energy – Energy may be defined as the ability to do work. It is a scalar physical quantity. Although energy is conserved, there are many different types of energy, such as kinetic energy, potential energy, light, sound, and nuclear energy. energy density – Energy density is the amount of energy stored or available by a system per unit volume. engineering – Engineering is the application of scientific principles to design or develop structures, equipment, or processes. The main branches of engineering include electrical engineering, mechanical engineering, chemical engineering, civil engineering, aerospace engineering, automotive engineering, and computer engineering. A person who practices engineering is called an engineer. enol – An enol is an alkene where a hydroxyl group is attached to one of the double bonded carbon atoms. Example: Butanol is an enol. The hydroxyl group is attached to the third carbon of the alkene chain. enolate – An enolate is an anion formed when a hydrogen atom is removed from the hydroxyl group of an enol. enriched uranium – Enriched uranium is a sample of uranium where the abundance of the isotope U-235 is increased above the natural abundance. Examples: Nuclear reactors need U-235 to produce a controlled nuclear chain reaction. Natural uranium contains only 0.7% U-235. Nuclear reactor fuel is typically enriched to contain approximately 5% U-235. enthalpy – Enthalpy is a thermodynamic property of a system. It reflects the capacity to do non-mechanical work and the capacity to release heat. Enthalpy is denoted as H; specific enthalpy denoted as h.
enthalpy change – An enthalpy change is approximately equal to the difference between the energy used to break bonds in a chemical reaction and the energy gained by the formation of new chemical bonds in the reaction. It describes the energy change of a system at constant pressure. Enthalpy change is denoted by ΔH. enthalpy of atomization – Enthalpy of atomization is the amount of enthalpy change when a compound’s bonds are broken and the component atoms are reduced to individual atoms. Enthalpy of atomization is denoted by the symbol ΔHa. enthalpy of fusion – Enthalpy of fusion is the change in enthalpy when a solid is melted into a liquid. Enthalpy of fusion is denoted by the symbol ΔHf. Also known as: heat of fusion. Example: The enthalpy of fusion for water is 334 kJ/kg or 79.72 calories/gram. enthalpy of reaction – The enthalpy of reaction (ΔHRXN) is the difference between the total enthalpy of the products of a reaction and the total enthalpy of the reactants. enthalpy of vaporization – Enthalpy of vaporization is the change in enthalpy when a liquid is converted to a gas at constant pressure. Enthalpy of vaporization is denoted by the symbol ΔHvap. Also known as: heat of vaporization. Example: The enthalpy of vaporization of water is 2257 kJ/kg. entropy – The measure of the disorder of a system, usually denoted by the letter S. A highly ordered system has low entropy. enzyme – An enzyme is a protein that functions as a catalyst for a chemical reaction. epsom salt – Epsom salt is a common name for the compound magnesium sulfate, MgSO4. equation of state – An equation of state is a relation between state variables. It is a thermodynamic equation which describes the state of matter under a given set of physical conditions, typically relating energy, temperature, volume, and pressure. Equations of state most commonly are used to describe the properties of fluids, such as liquids, gases, and plasma, though equations of state may also be applied to solids. equilibrium – Equilibrium is the state of a reversible reaction where the forward reaction rate is equal to the reverse reaction’s rate. equilibrium concentration – Equilibrium concentration of a product or reactant is the concentration of an aqueous solution of the reactant or product when the reaction is at chemical equilibrium. equilibrium constant – Equilibrium constant is the ratio of the equilibrium concentrations of the products raised to the power of their stoichiometric coefficients to the equilibrium concentrations of the reactants raised to the power of their stoichiometric coefficients. 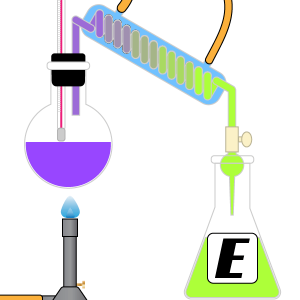 equivalence point – The equivalence point is the point in a titration where the amount of titrant added is enough to completely neutralize the analyte solution. erbium – Erbium is the name for the lanthanide element with atomic number 68 and is represented by the symbol Er. erg – An erg is the CGS unit of energy. 1 erg = 1 dyne·cm = 1 g·cm2/s2. essential amino acid – An essential amino acid is an amino acid which an organism needs to ingest because it is necessary for nutrition and cannot be synthesized in the body. Examples: Isoleucine and leucine are essential amino acids in humans. essential oil – An essential oil is a concentrated liquid containing the aroma compounds or terpenes of a plant. ester – An ester is an organic compound where the hydrogen in the compound’s carboxyl group is replaced with a hydrocarbon group. Esters have the general formula of RCOOR’. Example: Ethyl acetate is an ester. The hydrogen on the carboxyl group of acetic acid is replaced with an ethyl group. ether – An ether is an organic compound that contains two alkyl or aryl groups by an oxygen atom. The general formula for an ether is R-O-R’. The compound dimethyl ether is commonly known as ether. ethyl group – The ethyl group is an alkyl functional group where one of the hydrogen atoms from the ethane molecule is removed. The molecular formula for the ethyl group is CH3CH2-. Example: Ethylbenzene is a benzene ring connected to the ethyl group. europium – Europium is the name for the lanthanide element with atomic number 63 and is represented by the symbol Eu. evaporation – Evaporation is the process by which molecules undergo the a spontaneous transition from the liquid phase to the gas phase. Evaporation is the opposite of condensation. Example: The gradual drying of damp clothes is caused by the evaporation of water into water vapor. exa – Exa is the prefix associated with 1018 and is denoted by the symbol E.
excess reactant – The excess reactant is the reactant in a chemical reaction with a greater amount than necessary to react completely with the limiting reactant. excited state – Excited state refers to an atom, ion or molecule with an electron in a higher energy level than its ground state. exergonic – Exergonic refers to a chemical reaction where the free energy of the system decreases. exothermic – Exothermic is the term used to describe a reaction or process that releases energy in the form of heat. Sometimes the term is applied to processes that release other forms of energy, such as electrical energy, sound, or light. Example: Combustion of wood is an exothermic reaction. exothermic reaction – A chemical reaction that produces heat (has a negative change in enthalpy – ΔH). experimental yield – Experimental yield is the measured amount of product produced in a reaction. extensive property – An extensive property is a property of matter that changes as the amount of matter changes. Examples: Mass and volume are extensive properties. As more matter is added to a system, both the mass and the volume will change. extinction – In chemistry, extinction is a measure of the quantity of light absorbed by a sample. extremely low frequency radiation – Extremely Low Frequency radiation refers to the part of the electromagnetic spectrum with frequencies between 1 and 300 Hz. For radio communications and atmospheric studies, the extremely low-frequency range is between 30 and 3000 Hz. E-Z notation – E-Z notation is a method of describing the stereochemistry of double bonds. Each substituent attached to the carbons in the double bond are assigned a priority value. When the substituents with the highest priority are on the same side of the double bond, the compound is identified with an E- (entegegen – German for contrary). When the highest priority substituents are on the same side, the compound is identified with a Z- (zusammen – German for together).